It’s amazing how the human body can adjust to different climates, landscapes, altitudes and with such grace. A hike that the day before would have left me painfully huffing and puffing for air, this day felt difficult but manageable. Completing the trek to Everest Base Camp takes patience and a willingness to go slow. Our guide, Raj, always told us when the group took off sprinting up the climbs, “slowly, slowly,” – and this day we learned why. After finishing the first half of the day’s hike and dropping down a few hundred feet to the river’s edge, we stopped for lunch in the hot Himalayan sun. Our chatter though suddenly took a sobering turn as we watched a porter carrying a young man down the mountain. Riding Piggy-back, he looked pale and delirious. His body limp. The scary reality of Acute Altitude Sickness and/or food poisoning really sank in. But we all knew the experience was still worth the risk. From there my body climbed nicely upward to our night’s stopping point, Tengboche. 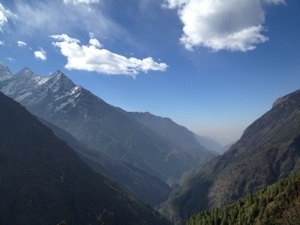 Situated in a high valley, Tengboche overlooks Everest in all its glory. With five guest houses, a bakery and one of the most important Buddhist monastaries in the Khumbu Valley, the small trekking town was quiet and beautiful. It’s location though turned the evening turbulent. As the afternoon clouds rolled in, the wind picked up (40+ mph gusts) and that evening an inch of snow covered the ground. But bundled up in our down sleeping bags, the storm outside only led to a clear beautiful morning dusted in white.